My Most Popular Blogposts of 2009 | When I Survey . . .
As 2009 wanes I took advantage of Google Analytics to find the ten most popular posts of the year. 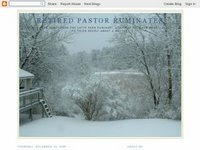 I learned that Retired Pastor Ruminates, which was launched on March 23, has 10,467 page-views, of which 6,928 were unique page-views, and the average time spent on the page was 3:19. They came from 53 countries, with the US being first, and all but two of its states represented. The other countries with the most visitors are in order of visits: the United Kingdom, New Zealand, Canada, Australia, Brazil, Germany, Netherlands, India, South Africa, Ireland and Singapore. Thank you for visiting Retired Pastor Ruminates, and come again in the New Year. Happy New Year! >I have been thoroughly enjoying coming over here to read Richard, thanks!